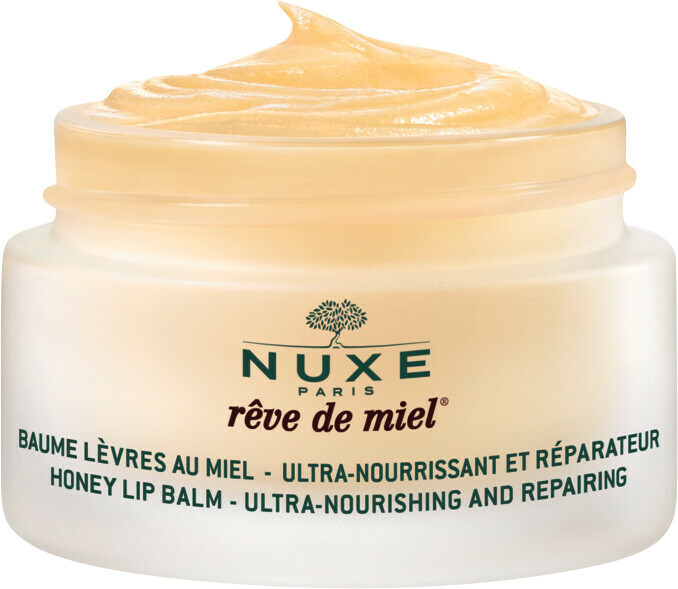 Soothe your chapped lips with the Nuxe Reve de Miel Honey Lip Balm, a delicious honey-infused lip moisturiser. When lips are dry and are in need of some intensive nourishment, this rich and restorative balm will restore suppleness. The concentration of natural ingredients includes repairing honey, ultra soothing plant oils, nourishing shea butter and soothing grapefruit essence, which also provides the balm’s luscious scent. With its exquisite texture and non-greasy feel, the Reve de Miel balm is a pleasure to use. Plus, now featuring a boosted concentration of shea butter for extra nourishment and propolis, a rare and precious substance produced by bees and known for its soothing, nourishing and tissue-regenerating properties, this intensive balm features an exceptional formula that is ideal for repairing very dry and damaged lips. A true cult product, one Reve de Miel balm is sold across the world every 28 seconds. Keep this divine formulation in your bag for gorgeously glossy and nourished lips on the go. Apply the balm to the lips and lip contour as often as required all year round. It can even be used on sores and light burns. Paraben-free, mineral oil-free, artificial fragrance-free. 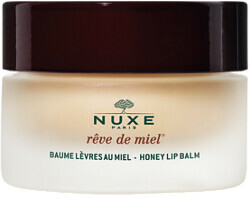 Nuxe Reve de Miel Honey Lip Balm 15g is rated 4.7 out of 5 by 153. Rated 5 out of 5 by Nancy1958 from This works! This was my second time of purchasing this lip balm which I wouldn't be without now.its rich,non greasy.mousturising, fantastic under lipstick.I can't sing it's praises highly enough.have also bought it for both my daughters and they too are addicted.. Rated 5 out of 5 by MBart from The only lip balm I swear by This little pot is magic - it's completely fantastic. It's honestly more of a lip mask. A little bit of this on your lips before bed and you'll wake up like JLo. It's the only lip treatment i'll use - buy it now. Rated 5 out of 5 by Blessed from This works I have been using this lip balm for a few years and it works very well for me. I have tried many other lip balms, even the more expensive ones but I always return to Nuxe. I add a drop of Jojoba oil to the balm which makes it a little softer for ease of application. Rated 1 out of 5 by katherine97 from Horrid! I had previously used the Ultra-Nourishing Lip Balm from the same brand and loved it. My lips were happy and healthy. However, bought this Honey one instead as it's the only one sold on here. I'm sad to say it is absolutely horrid! I have ultra sensitive, dry and cracked lips and this balm literally just sits on top of your lips like a heavy lump of clay. It does nothing. It doesn't smooth out nor absorb into your lips so let alone moisturise or fix any problems. It aids the cracking and inflammation on my lips 200% because it just sits there and seriously irritates the skin, and bacteria grows freely. The corners of my lips are still really bad and I'm still looking for a solution to this mess. I've always loved products on Escentual but highly disappointed with this purchase! Do not buy I beg you!